Easy Living – modern items for your living room! The living room is after all the heart of the home and the room that sets the tone in the rest of the house or apartment. This is the lounge area where we hang out with our family and friends along with being the room where we invite everyone to activities of all kind. For sure, we would like the living room to be just as functional as tasteful and inspiring. With simple means you can make the living room feel like new again and an improvement could be to add an eye-catching armchair, a larger coffee table or a colorful carpet. If you don’t want to go all the way, you can simply add details such as ceramics, vases, sculptures and art to freshen up the room. In the theme auction Easy Living we have gathered larger as well as smaller objects which all fits perfectly in the home’s most important room. 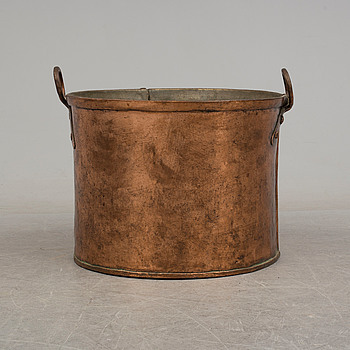 a copper barrel, 19th century. 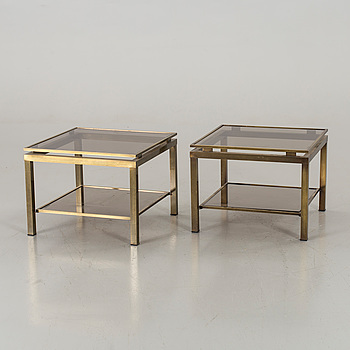 A PAIR OF SOFA/SIDE TABLES, second half of 20th century. A pair of 21:st century table lamps. A pair of 1960s/1970s arm chairs by Jean Gillon. JOSEF FRANK, a waste paper basket by Firma Svenskt Tenn.
A COFFEE TABLE "Tavolo con Ruote", by Gae Aulenti, Fontana Arte, Italy. A GLAS TOP COFFEE TABLE. A pair of chairs by Sam Larsson for Dux, designed in 1974. A pair of Italian alabaster table lights, second half of the 20th Century. a pair of brass table lamps, second half of the 20th century. BORD / SIDEBOARD, 1900-talets senare del. A second half of the 20th century lounge table. A late 20th century travertine and marble lounge table. A 1950/60's danish lounge table. BRUNO MATHSSON, a pair of "Jetson" loungechairs. A SOFA/SIDE TABLE, end of 20th century. A pair of late 20th cenutry floor lamps, by Bergboms Scanlight. BRUNO MATHSSON, bed /day bed, "T 303, BERLIN 60", designed 1957 for Karl Mathsson, Värnamo Sweden, dated 1964. A SOFA TABLE, end of 20th century. A pair of the 20th century brass and glass wall lights. Two "Panthella" table lamps, designed by Wener Panton for Louis Poulsen, 20th century. A mid 20th cenutry "Minerva" sofa table, designed by Peter Hvidt and Orla Mølgaard-Nielsen for France & Søn. A "Fenix" lazy chair by Sam Larson for Dux, second half of the 20th century. VITRIINI/SENKKI, 'Aleksis' nro 423, Asko 1930-luku. Two chest of drawers second half of the 20th century. a mid 20th century table lamp, possibly from Italy. 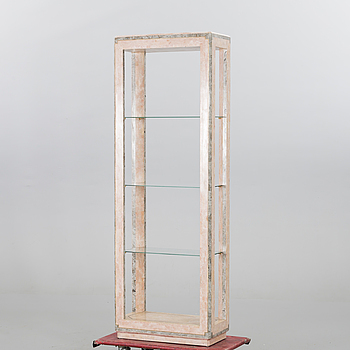 a 1930's bar cabinet attributed to Greta Magnusson Grossman in the 1930's. A SIDE/SOFA TABLE, end of 20th century. A late 20th century travertine lounge table. A 1960's/70's brass ceiling lamp. a "Relemme 75" ceiling light by ACHILLE & PIER GIACOMO CASTIGLIONI for Flos, designed in 1962. CARL MALMSTEN, a 'Farmor' easy chair. A pair of 'Apila' pinewood stools by Lisa Johansson-Pape, Oy Stockmann Ab, Kervo Snickerifabrik, 1970/80´s. A 'Jeston' easy chair by Bruno mathsson for Dux, second half of the 20th century. A Henrik Thor-Larsen "Ovalia" easy chair and stool, Torlan, Staffanstorp, Sweden 1960-70's. KARVALANKAMATTO, Suomi. Noin 250x153 cm. 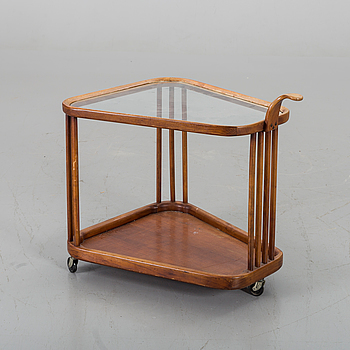 A VITRINE SOFA TABLE, end of 20th century. A PAIR OF 1980'S ARMCHAIRS. A pair of armchairs, made in the second half of the 20th century. 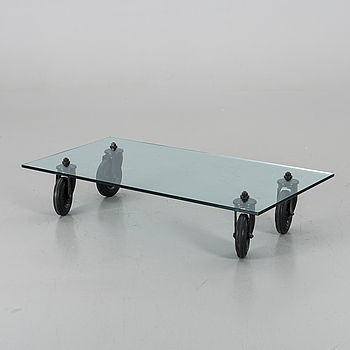 A GLASS SOFA TABLE, around the year 2000. ARNE JACOBSEN, pöytävalaisin, "AJ", Louis Poulsen. KATTOVALAISIN, Taito Oy. 1900-luvun alkupuoli. ILMARI TAPIOVAARA, kattovalaisimia, 2 kpl, "Maija Suspension" Santa & Cole, 1900-luvun loppu. PABLO PICASSO, a 'Service visage noir, assiette K' faience plate, Madoura, Vallauris, France. PETER HVIDT & ORLA MØLGAARD NIELSEN, a pair of X-chair. SOFFBORD, AG, Börge Mogensen, Danmark, 1950-tal, för Fredericia Stolefabrik, modell 264. A ITALIAN CEILING LAMP ARREDOLUCE MONZA IN ITALY MID 20TH CENTURY. FOLKE TRUEDSSON, bronze sculpture, signed. A TOP GLASS COFFEE TABLE. SECOND HALF OF 20TH CENTURY. WASSILY KANDINSKY, litograph in colours, sign and dated in the print -39, numbered 141/300. 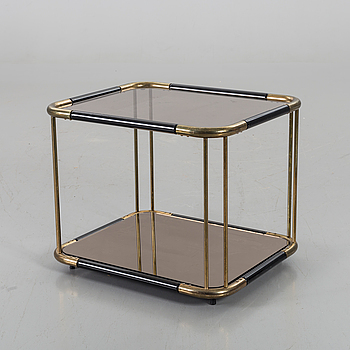 A late 20th century coffee table. a rattan chair by Gio Ponti & Lio Carminati, Italy, second half of the 20th century. EMIL WIKSTRÖM, veistos, kipsiä, signeerattu ja päivätty 1905. CARL-HARRY STÅLHANE, a stoneware vase from Rörstrand. A model 2077 vitrine by Josef Frank for Firma Svensk Tenn, post 1985. BRUNO MATHSSON, a pair of "Karin" armchairs, 1974. ANN WÅHLSTRÖM, an enameled iron vase from Cultura Metal, signed and numbered 115.
a dining table '81B' and four '66' chairs by Alvar Aalto, Artek. RUNE HAGBERG, mixed media object signed RH. a set of four model 60 chairs by Alvar Aalto, Artek. 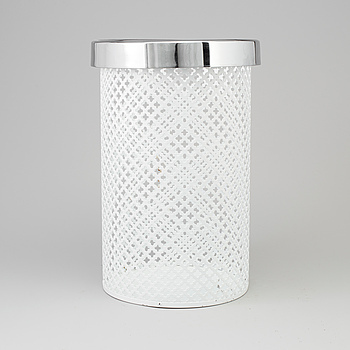 A chromed metal Stille stool. A 1960s "Mobile-Tulitus" chandelier by KAIJA AARIKKA & TIMO SARPANEVA, Finland. 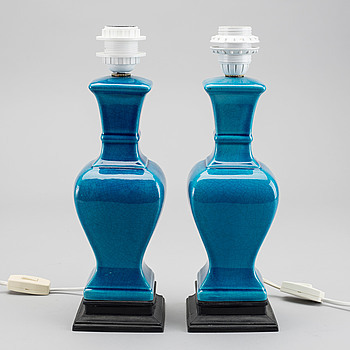 A pair of 1960/70s table lamps, designed by Uno & Östen Kristiansson for Luxus. A pair of 1930/40s armchairs. 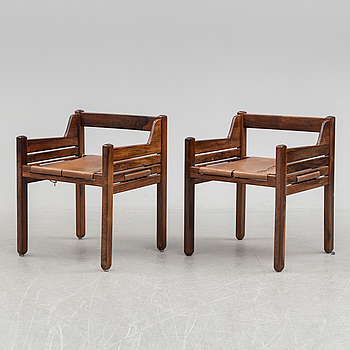 A pair of 1970s lazy-chairs by Viskadalens Möbelindustri. A SMALL GLASS SOFA TABLE. A ROLF FAGERBERG STONEWARE PLATE. a Ceiling lamp by Doria Lichtenwerken, Austria, 1960/70s. a dining table '81B' and four '69' chairs by Alvar Aalto, Artek. VERNER PANTON, ceiling lamp, VP-globe, Poul Henningsen, 1970's. A second half of the 20th century ceiling ight by Alvar Aalto. A pair of wall lights by Gino Sarfatti for Arteluce, Italy, 21st century.